It’s an eccentric trend that food these days is now being used as a means to slow down the aging process, which shouldn’t be too surprising because after all, food is what we consume to replenish our bodies. With the many breakthroughs and discoveries regarding skin care, one that has been proven very effective is the use of caviar. Caviar is rich in omega-3 fatty acids, an essential nutrient that replenishes the skin and hydrates it, thus preventing the skin from drying. The surface of caviar is parallel to the structure of the human epithelial cells, which allows for a speedy absorption and makes it a highly efficient component. Its exceptional skin renewal capability also provides a long-lasting firm complexion, ideal for women intheir 30’s and 40’s. Gold, on the other hand, is another unusual ingredient used for the skin and is known to detoxify—which helps discharge different harmful substances from the body. Its ionic action encourages blood circulation, countering chloasma and freckles, and slows down the normal aging process. The SKINFOOD Gold Caviar Line is a comprehensive line of skincare cosmetics made from first-class Russian caviar and pure gold that restores, nourishes, firms, and fortifies the skin. It comes in a line-up of different products that support each other and are designed to give women the moist, well-founded and youthful skin they’ve always wanted. 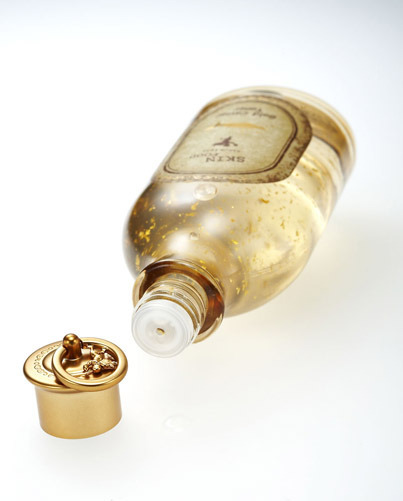 First use the Gold Caviar Toner, which defies wrinkles, and boosts, cultivates and firms the skin. Next, gently dab on the Gold Caviar Eye-Lifting Serum to promote firmness and an even tone in the delicate eye area. The third step is to apply the Gold Caviar Serum, a comprehensive anti-aging action that helps fight wrinkles, moistens, nourishes and firms up the skin. Fourth is the Gold Caviar Emulsion, which moisturizes and revitalizes the skin. Lastly, apply the Gold Caviar Cream—formulated to provide anti-aging and renewal effects. It’s a wonderful line of skincare cosmetics, because it’s comprehensive and it addresses the concerns of many women, especially those with dry skin and are in need of nourishing exfoliation. Each December Glamourbox comes with the SKINFOOD Gold Caviar Toner and Gold Caviar Emulsion—giving you a great opportunity to try and see the effects for yourself! Channel that inner Golden Girl with SKINFOOD’s Gold Caviar Line!